Boynton Preserve - Haddam Land Trust, Inc. 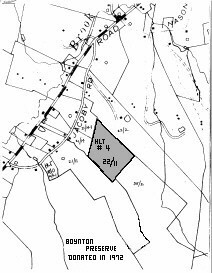 The Boynton Preserve in Higganum was donated to the Land Trust in 1972 by Theda Boynton in memory of her son, Peter Boynton. It is approximately 15 acres and has a 50 foot wide right-of-way from Jacoby Road.